Guild of St Clare: Exciting new acquisition! Thanks to the generosity of the St Catherine's Trust, the Guild of St Clare has some exciting acquisitions - three beautiful Brother Innovis Anniversary sewing machines. 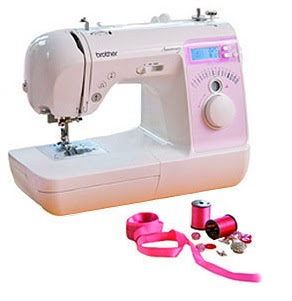 They have a total of 16 stitches, an automatic needle threading system (anyone who has struggled trying to thread machine needles by hand will know this is good news), and best of all a speed limiter, so the machine doesn't run away with its user! The machines will be used for teaching children at the Guild of St Clare children's chapter meetings and also at the St Catherine's Trust Summer School. They will also be available for loan to ladies doing sewing for liturgical purposes.